Look around when you are in a restaurant, on a train, or at an airport gate. Everyone (or almost everyone) is on a phone, madly scrolling down. Nobody wants to be bored, even for a little bit. Yet, according to some research, boredom is actually good for our brains, because it makes us more creative, learn new skills, and develop new ideas. For me it’s definitely true. I am talking about the creativity part. As soon as we come back to the little island in South Florida, I start bursting with ideas and am not afraid of trying anything. Are you afraid of boredom when you pick a new project? Do you have a “boredom index” so to speak? Well, for me on a scale from 1 to 10, where 10 is the maximum boredom possible, shawls are definitely 11. I believe I’ve told you how much I dislike making shawls here. I made my last one about 10 years ago as a gift and then just stopped. However, my first project of a new year was… a shawl! Why? Because I fell in love with the designer! Emily Greene is my favorite now and as soon as I see her new designs I want them. They all look modern and at the same time intrinsically wearable. This is why I bought her designs for shawls and even talked myself into making one. 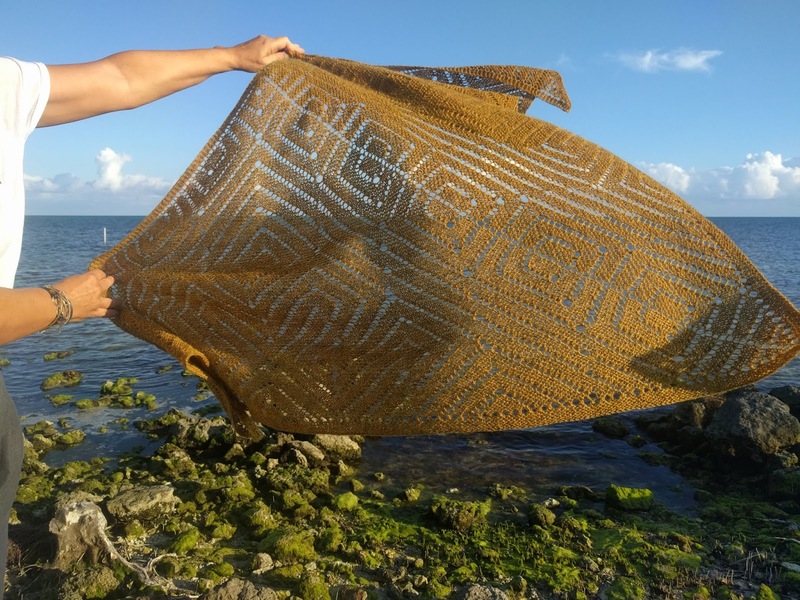 The yarn – Isager Tvinni wool – was initially acquired for a cardigan but I decided to sacrifice it for a shawl because of its color. It is a combination of yellow, grey, and brown with a touch of green -- one of my favorite colors and extremely trendy this year. I didn’t have any problems with the pattern or yarn and the shawl was growing slowly but steadily. Shawls can be tricky. They require all your attention and concentration because one mistake, one forgotten “yarn over” or “two together” and you are stuck and have to unravel many tiny stitches to fix your error and move on. 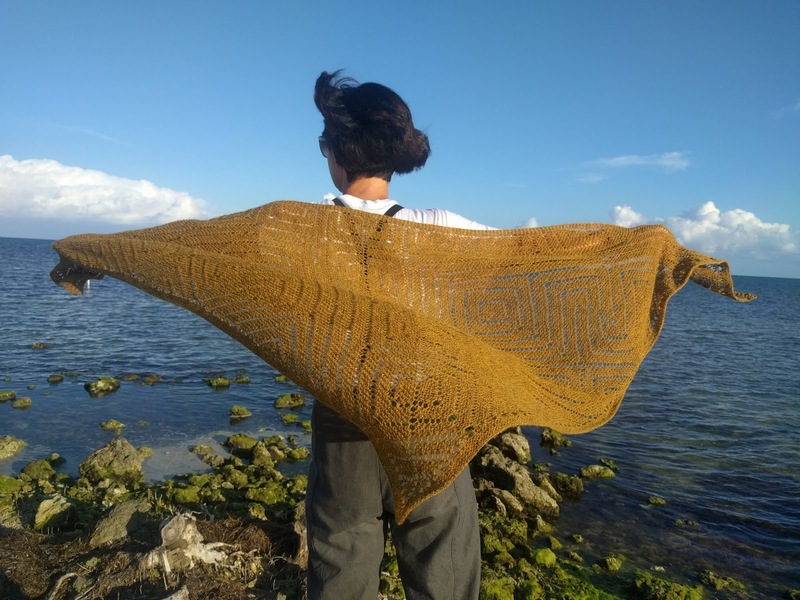 I couldn’t take a shawl to a knitting club, a trip, or a doctor’s appointment. It was too risky. I didn’t want to make a mistake and then unravel 400 stitches for several rows, thank you very much. 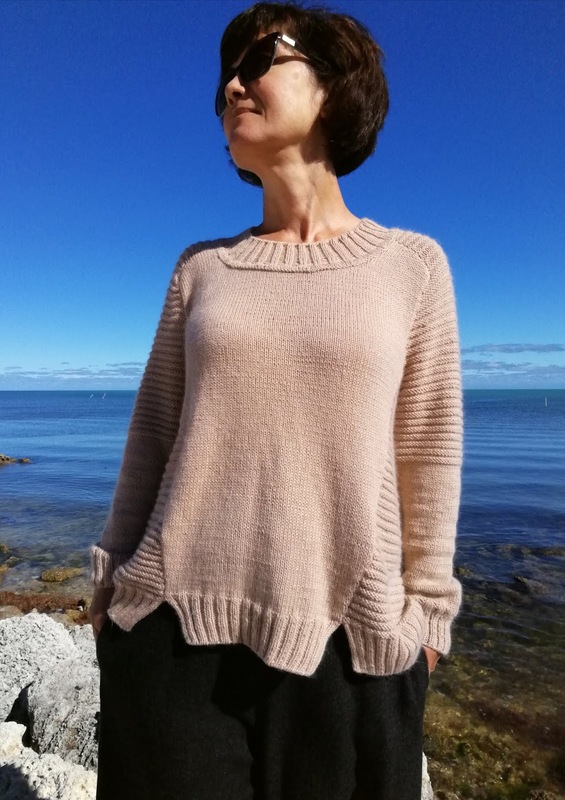 So I picked another project, mostly stockinette, from Phildar fall-winter 2018-19 magazine Nos Fils Essentiels. It is called Pull Lou and has an unusual construction: it is made out of 6 separate parts sewn together. This construction was what initially attracted me to the pattern. 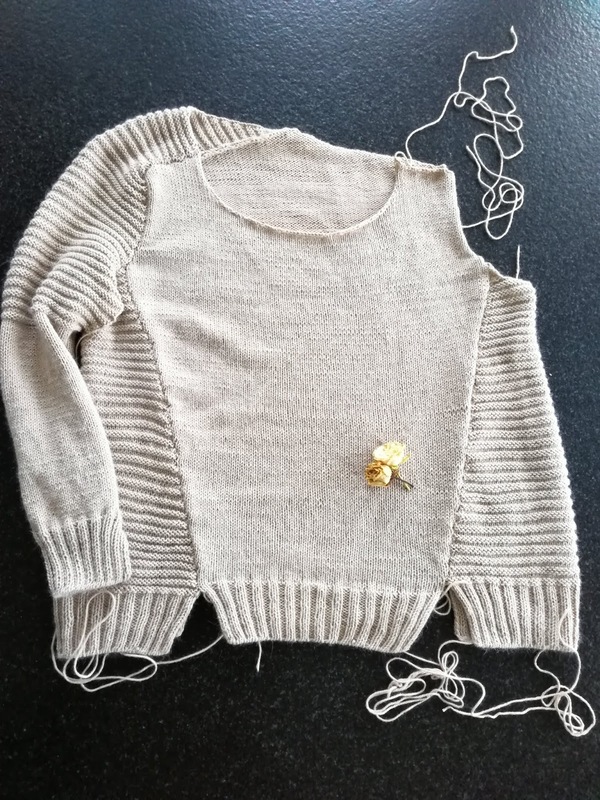 The yarn that I used for this sweater – Rowan’s Cashcotton – has been in my stash for about 10 years. It didn’t want to become any of the several projects I planned for it. So I left it alone and then forgot about it. Somehow it came back from oblivion last fall and I started looking for a project for it – again. I had almost the same gauge with this yarn on US 2 ½ needles as is required for Lou. There are two gauges in this pattern – one is for stockinette, another – for 2 k rows, 2 p rows, called the “point godron”. And they both matched. It doesn’t happen often so I took it for a “sign” to finally start working with this yarn. I had enough to make the smallest size. I was working on this sweater while watching TV or in the knitting club. It was growing fast and I was already looking for another simple project when it came to a halt on sleeves. The sleeves for this pullover are a bit unusual and I couldn’t even imagine how they would fit with the body. I knew that I had to make them shorter – I always shorten my sleeves for my short arms. Otherwise, I followed the pattern but felt completely in the dark. At this moment my enthusiasm for the sweater started to fade. It is hard to keep being excited making something that doesn’t excite you anymore. Looking at my needles I saw a weirdly shaped ribbon-like thing that didn’t make much sense to me. As soon as the first sleeve was finished I put together the front, back, one of the side pieces, and sleeve. It took me 5 attempts to do it but eventually they all fit together and I was rewarded with a nice looking and well-fitting single-sleeved sweater. Score for me! Yet, there was another quite unexpected problem. The yarn was shedding mercilessly leaving fuzz all over my clothes. 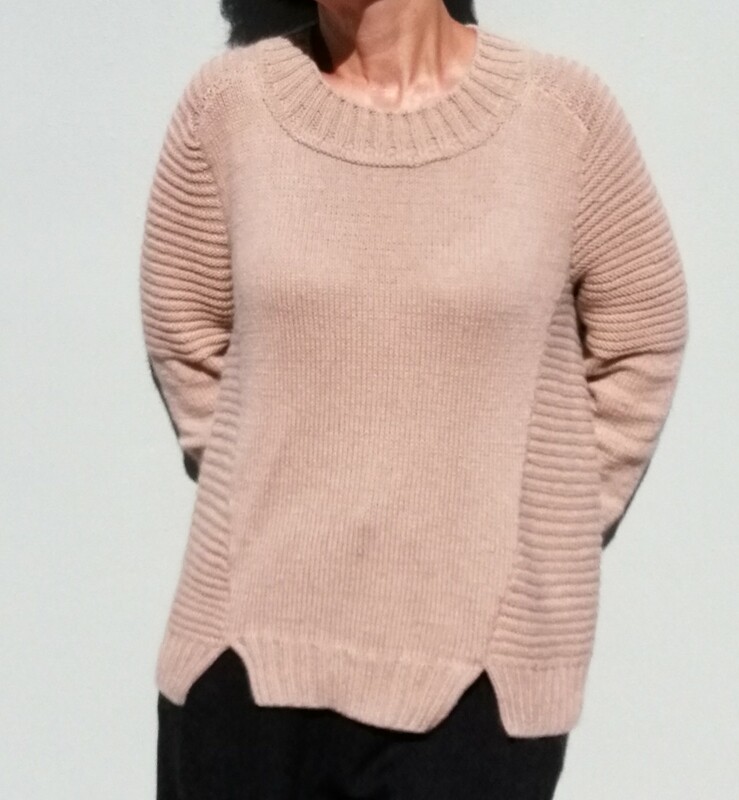 I didn’t notice it before because when I started making this sweater I was mainly wearing white shorts and t-shirts. However, the Arctic vortex brought colder air everywhere, even to Florida. As soon as I put some pants on, the messy yarn situation became quite obvious. I went online to look for a solution and found not one but two. The first one – putting yarn and sweaters in a freezer for several hours – worked for me to some extent. After two nights in a freezer, my new sweater stopped shedding so much. But there was still some fuzz visible on most of my black pants (except the ones that I was wearing for the photoshoot). The second solution was to hand-wash the sweater and then air dry it in a dryer for 10-15 min. Even though I didn’t find any fuzz in the filter after air drying the sweater, it seems definitely less fuzzy than before. Besides the fuzz, I love everything about this sweater. 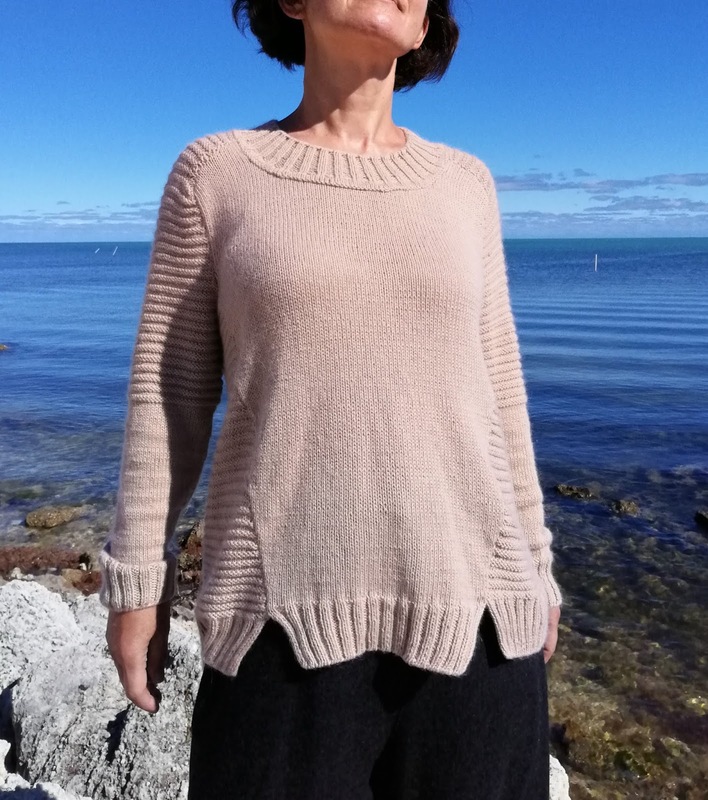 It is modern looking, flattering, and easy to wear with anything and excellent for winters in Florida. I made a special effort while finishing it and spent about 3 hours on YouTube to learn how to make its collar look less handmade and more professionally finished (this video can be useful only for the Russian speakers because it is in Russian - sorry!). I am so glad that I decided not to cut corners with this one. More pictures and words on my Ravelry page. As for the shawl, it got finished as well. I had 4 balls of yarn and used 3 full balls and just a bit of the fourth ball (more – on my Ravelry page). This shawl could be worn in many different ways and the color would brighten up any outfit. 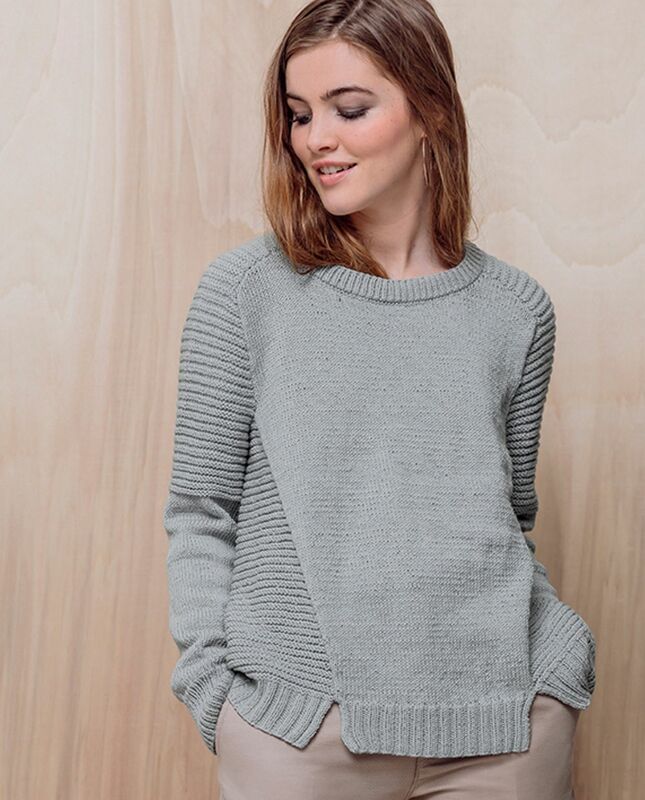 Yes, mistakes were made – they are almost unavoidable in a handmade garment. But I think they give more character to it and if I don’t notice them, no one else will. As to what is next in my knitting plans, I started two more boring projects. It looks like boredom and I are becoming BFFs. Get ready for a creativity blast!